I like to work with customers who are willing to do the personal and professional transformation to become innovative and agile. If I look at my customer set, they’re usually between 32 and 55 years old. They already have work experience, but they either want to be able to create sustainable change or innovate their business. I understand them, I like them, they happen to be like me, and fortunately they can afford to work with me! In a recent article we looked at why you needed to explore, engage and extrapolate to discover the pains, gains and jobs to be done of your customer. This is part of understanding what your customer wants before they even know. Now, let’s have a look at the engage part of the looping, and decide what customers you want to engage in the future and start building a customer map. Of course, you know who your customers are today. Over the years you will have built up and attracted a certain type of customer based on your activities and products, and on who you are. These are your traditional customers. Now we need to decide which customers you know, you like and can afford you given your new sense of purpose. That may be a completely different set of customers than you have today. Knowing customers doesn’t mean you know their statistics, data, and stereotypes. It means you know their problems profoundly, probably because you are like them. In the agricultural machinery business that I work with, the founder was a farmer who couldn’t afford the machines he needed and started to make his own machinery. He now builds machines for farmers who are discerning in what machines they use because they’re engineers and farmers too. What stages did I go through in life? What were my problems, issues, needs, trends in that period of my life? What are the emerging problems, issues, needs, and trends? What do I know deeply to be true about this customer based on my own experience, but also the experience I have gathered in serving this customer? We know that if you base your business on customers you know, you’ll build a sustainable business because they grow as you grow. Now let’s consider which customers you like. So, of all the customers you know make a subset of those you like. If you can’t find anything to like in your customer, you’re in the wrong business. If you’re in it for the long-term you have to like your customers, perhaps even love them. 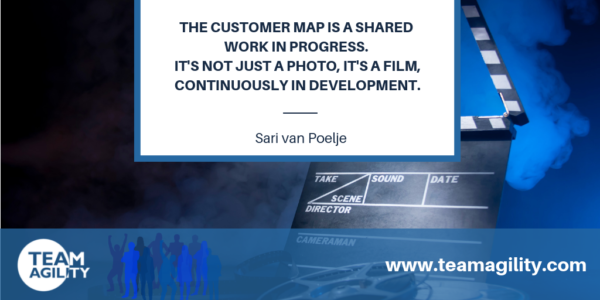 The customer map is a shared work in progress. It’s not just a photo, it’s a film, continuously in development. Now you need to figure out which customers can afford you. There are two ways to go about that. Return on customer investment: One way is to think about the return on investment you want at the end of the year. Traditional businesses want to maximize profits and shareholder value every year – this is what we’ve put in, this is what we want to get out.Businesses that are most innovative and agile, look for customers that can also afford their contribution to society. In our experience organizations that only focus on maximizing profits usually have short-term cycles of production and innovation, and that does not help them to create sustainable income. Work backwards: The other way to calculate which customers can afford you, if you’re a startup business or a solo business, is to think backwards. Ask yourself what income you want to have and then calculate backwards to work out what you need to make every month, every week, every engagement. You might find, surprisingly, you come to very different calculations than if you just go for maximizing profit. So, we know the pains, gains and jobs to be done, we know what customers you want to engage (know, like, and afford) now it’s time to create a customer map. Based on the exploration and engagement activities we ask senior leaders to make a mosaic, a mood board or a customer map. The pains gains and jobs to be done of your customer. List the types of customers who you know, like and can afford you. Add photos of real customers if possible, make the map realistic. Give each customer avatar a name, write down their problems, issues, needs and trends, to create a customer map. Hang the customer maps in the hallway from workplace to canteen with magazines, scissors and glue underneath so that any employee can add to the map as they go by.